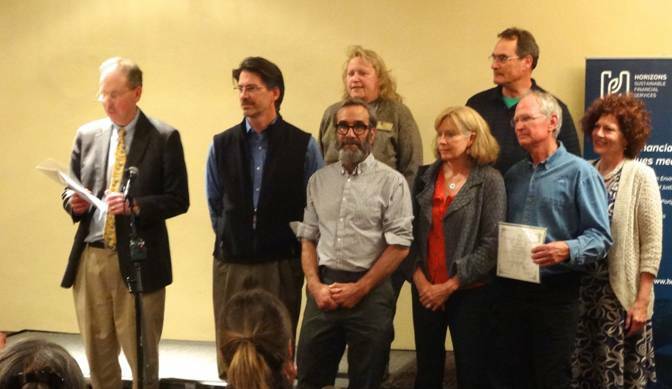 April 19, 2015 – The City of Santa Fe’s Sustainable Santa Fe Commission recently announced that the Water Efficiency Rating Score’s (WERS) Founding Development Team won a Sustainable Santa Fe Award. The Commission bestowed the honor in the “Water Adaptation” category for “developing an accurate and flexible tool to drive water conservation in measurable ways”. The WERS program is a performance-based, interactive water conservation tool for new and existing homes. It uses a scoring scale of zero to 100, with zero being the most desirable. The program analyzes indoor water usage, as well as rainwater and graywater usage. The City of Santa Fe has passed a resolution calling for its addition to their green building code. The New Mexico legislature and Governor recently added a water efficiency requirement to their sustainable building tax credit and will look to the WERS program for assistance. Numerous communities and green building programs are looking to utilize this innovative program. “WERS is the much-needed miles per gallon water performance metric for our homes. It simplifies performance standards for the homeowner,” stated Deirdre Irwin, Water Conservation Initiative Leader for St. Johns River Water Management District. The Sustainable Santa Fe Awards Gala took place on April 8th and was sponsored by the City of Santa Fe Sustainable Santa Fe Commission, the Green Chamber of Commerce, Earth Care, the Green Fire Times, and hosted by Green Drinks, La Fonda Hotel and Horizons Sustainable Financial Services. Current members of the WERS development team include: Kim Shanahan – Executive Director, Santa Fe Area Home Builders Association (SFAHBA); Nancy Avedisian – Green Realtor, Barker Realty and Member of Santa Fe Water Conservation Committee (SFWCC); Steve Hale – Executive Director, Build Green New Mexico; Laureen Blissard – LEED AP, HERS rater and Technical Director of the Green Builder® Coalition; David Dunlap – Builder, Tierra Concepts of Santa Fe; Amanda Hatherly – Director of the New Mexico Energy$mart Academy at the Santa Fe Community College (SFCC); Doug Pushard – Founder of HarvestH2o and Member of the SFWCC; Bill Roth – Past President of the SFAHBA and Member of the SFWCC; Bob Kreger – Owner, Kreger Design Build; Teri Buhl – Green Building Science Consultant, EverGreen Building Solutions; George Van Hoesen – Owner, Global Green Building LLC; Darren S. Port – Building Energy Codes Manager, Northeast Energy Efficiency Partnership; Irwin and Collignon.